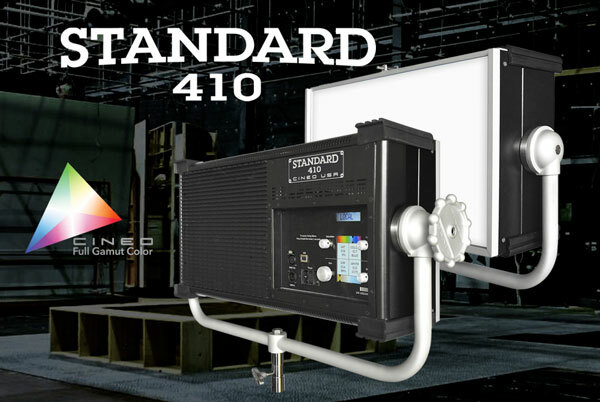 Cineo has added yet another powerful creative tool to the lighting professional’s arsenal – the Standard 410. Combining their award-winning white-light quality with innovative saturated-color technology, the Standard 410 delivers up to 25,000 lumens of beautiful, easily controllable, full-gamut light. Boasting a substantial 2’ x 1’ diffused illuminating surface, the Standard 410 is perfectly sized for use in the studio or out in the field. With a maximum power of 410 watts and weighing in at less than 27 lbs., this fixture offers a unique combination of convenience and capability. Creating beautiful light within an extended color gamut is only part of the story. Cineo has developed an intuitive control strategy that allows predictable, repeatable results, either using the graphical control panel or remotely with wired or built-in wireless CRMX control. CCT – For color-accurate white light, choose the CCT as you would with any Cineo fixture, using the CCT rotary control or the second DMX channel. Saturation controls the amount of saturated color to be added to the white light, from full white to fully saturated color, managed on the third DMX channel. Hue – To optionally add saturated color, the HUE control adjusts the hue, the color of which is displayed on the control panel, or managed on the fourth DMX channel. With Standard 410, the same color shading can be achieved regardless of the CCT used for photography. For example, +2 Green added to 3200K CCT will look the same as +2 Green at 5600K to the correctly white-balanced camera. In addition to our proprietary phosphor-converted white light LEDs, we developed phosphor-converted saturated color LEDs. These work with the phosphor recipes in the white LEDs to create a balanced, natural-looking spectrum featuring Cineo’s deep-red color rendering technology. The saturated color LEDs use the exact same dies as the white LEDs, so all light emitting elements of the Standard 410 carry identical thermal stability, and perform over time with identical differential aging. So after years of service, color stability remains consistent.